FightingArts.com - Pilates?... But I?m A Martial Artist! Pilates?... But I’m A Martial Artist! This Pilates exercise known as the mermaid stretches, strengthens and lengthens torso, stretches hips, waist shoulders and arms, improves core connection and balance. Pilates is a method of exercise and physical movement designed to stretch and strengthen the body core, particularly the abdomen and back muscles, promote muscle balance within the body, and also develop coordination. Widely practiced by dancers for decades. Pilates has more recently become an important adjunct to sports training, rehabilitation and general fitness. It is now taught widely in heath clubs, YMCAs and in schools. Frequently I am asked by martial arts students why they should add Pilates to their training schedule, and the answer is always simple: Pilates builds core (body) strength that is essential for martial artists to hone their craft and to prevent injuries. Speaking from personal experience I can say with great confidence that Pilates has changed my life and the way that I practice karate in a positive way. I have been studying karate since 1985 and unfortunately was prone to injuries especially in both hamstrings and in my left shoulder. It wasn’t until I started training in bodywork, both in Pilates and Gyrotonic Movement (a system of yoga-like moving exercises performed on a specialized machine), that I started to understand why. I was not holding my body (muscles and bones) in proper alignment and as a result I suffered self-inflicted injuries due to repetitive movements while using improper posture. Improper posture is usually caused by certain muscles being too strong and tight while other muscles are too loose and weak. This is a problem that can be corrected with a regular Pilates practice and is a tried and true method of exercise used by both professional and amateur athletes alike. Joseph Pilates a German national was a performer and boxer living in England who studied exercise, Zen, yoga and ancient Greek and Roman exercise systems. With the outbreak of WWI he was interned and began teaching a system of floor exercise and concepts to other internees. Transferred to another camp as a nurse or caretaker, he began devising equipment rigged together with pullies and springs taken from beds to help those with wartime disease and physical injuries. This was the genesis of the Pilates that further evolved under the guidance of his wife Clara, a nurse, to better fit the needs seriously ill or injured patients. It is not widely known that Joseph Pilates, the founder of Pilates, originally worked with boxers. This is why his exercise system applies very well to martial artists. It was his belief that the body is healthier when it practices stretching, strengthening and control-type exercises in addition to the actual sport activity itself. Most martial artists have some form of this in their weekly routines, but often slow steady exertion with stretching control are hurried through in favor of the activity itself. In addition, some martial artists attempt to meditate regularly, and this focus on breathing is also in line with the Pilates philosophy. Slow steady breathing with exertion (i.e. ibuki breathing – the tightening of the abdominals inward with a long slow breath) is a large part of a successful Pilates practice. When teaching Pilates to martial artists I like to do almost double the amount of leg exercises than in a typical Pilates class. This is because martial artists need to strengthen their gluteus muscles (the buttocks) in order to make their legs feel lighter and make the act of kicking easier and more effortless. These exercises include practicing anchoring the pelvis by pulling the abdominal and torso-related muscles inward while reaching and extending through the legs in various movements. This not only strengthens the body but also helps to lengthen the torso and open the hip joints making difficult kicks and kicking combinations easier. The shoulder stretches (open hand) stretches and strengthens muscles of the arm and shoulders, improves ability to lengthen through entire limb. In Pilates, there is also an emphasis on learning how to keep your shoulders down and away from your head, lengthening the neck and strengthening the muscles under the armpits that create a longer spine. Strengthening the proper muscles for correct posture helps to prevent back injuries and create longer lines in the body. This creates the space a martial artist needs in the joints and between the bones in case of a misstep, a bad turn or punch while practicing and is the difference between a quick, shake-it-off type injury versus a permanent one. I welcome you to experience the power of Pilates by taking your martial art to the next level. It is my intention to keep training for many, many years to come and I know that my Pilates practice will certainly be a large part of attaining that goal. A graduate of Cornell University, Ms. Sheftall is both a certified Pilates and Gyrotonic Movement Instructor. 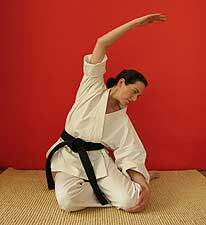 Always a fan of sports, Ms. Sheftall began training in karate after the brutal attack of her best friend in 1985. This exposure to martial arts led to a desire for her to pursue a career as a karate teacher. After several setbacks with shoulder and hamstring injuries she started training in Gyrotonic Movement and Pilates to better understand the causes and possible future prevention of her injuries. This led to the creation of specialized Pilates Mat workouts for martial artists to supplement their training and thereby reduce the chances of injuries and prolong the ability to train actively as they mature. Ms. Sheftall founded Karate Pilates, Inc. in 2004 and produced her first Karate Pilates Workout DVD in 2006. Ms. Sheftall teaches karate, Pilates and Gyrotonic Movement full-time and has fulfilled her dream of doing what she has always wanted to do for a living - sharing knowledge and helping others. 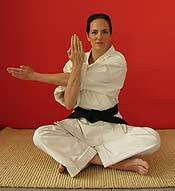 In addition, she teaches annual Karate Pilates seminars at World Seido Karate and most recently taught her Karate Pilates seminars at the 30th Anniversary event at Columbia University for Seido Karate. 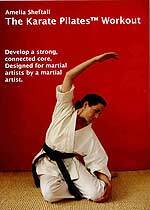 She also teaches Karate at the Seido Karate World Headquarters in Manhattan under Kaicho Tadashi Nakamura.